I saw this photo today on a news website that I read a few times a day — this photo immediately replayed a short snippet of the episode that this wee puppy was introduced. For those that don’t know that guy in the photo — that’s Kevin Arnold (Fred Savage) and the puppy he is gleefully holding is the puppy his grandfather bought him. 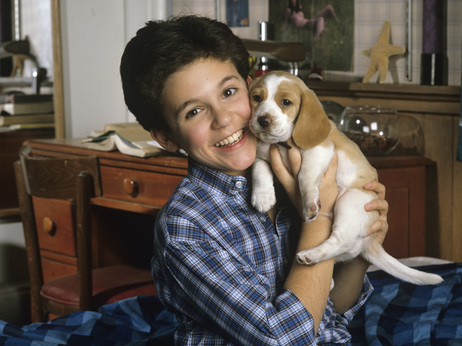 A puppy and a gift that was a big deal in the super awesome showThe Wonder Years. A show that I watched religiously growing up and that to my surprise has held up pretty well. It’s funny how just this snapshot brought back a number of images of that show that so helped create the person I am today. I remember cooing out loud when Kevin’s grandfather pulled that puppy out from behind his back — I remember pestering my mother immediately after that episode that I thought we should get a puppy — and of course, anytime I think of that show my inner jukebox plays Joe Cocker’s “Have a Little Faith in Me” and that iconic moment of Kevin kissing Winnie for the first time comes flooding back. ……umm…..wasn’t it “With a Little Help From My Friends”…….albeit not a Joe Cocker groupie but certainly a Beatle one……yes? That was the intro song right? Oh, wow. I remember staying up and watching this with my parents. So many memories!